Finally! 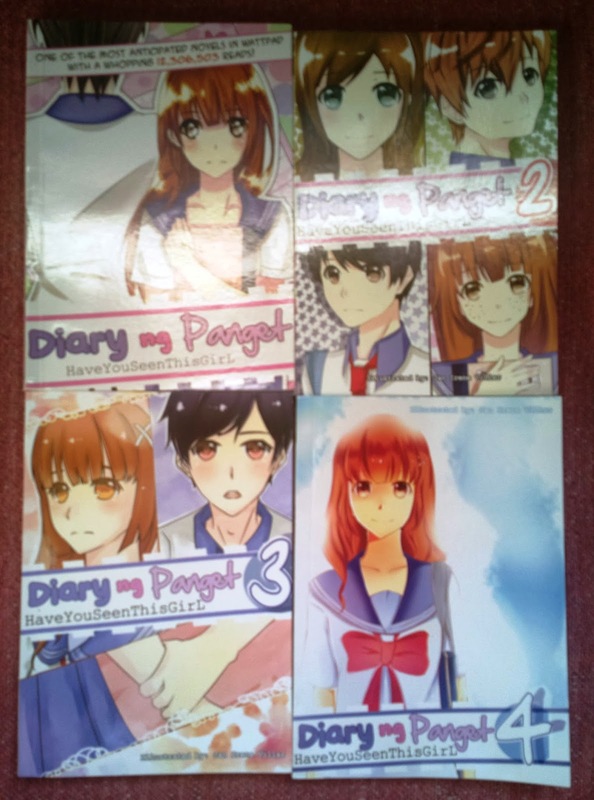 I have the complete 4 volumes of Diary ng Panget! And the epilogue for the story is a surprising story within a story twist. The author, Denny aka HaveYouSeenThisGirl made us fall in love and held our hopes high for a cliché Cinderella story with a perfect guy falling for an unlikely swan err… duckling. But all our hopes were dashed to pieces when it turned out to be the heroine, the supposedly real Reah “Eya” Rodriguez’s imaginative story based on real persons from her school including Cross Sandford and the rest of the crew whom she never really knew in real life except for her bestfriend Diandra whom she turned into her cousin at the latter part of the story. She wrote the story as entries in her diary in the hope of making the boring posts more exciting. Incidentally, the diary was lost and fell into the hands of the real Cross who even mimicked several lines from the story’s introductory chapter. There begins a feud from their first ever meeting. So the epilogue ends with the real Eya wondering if her written story may soon come to life and her own humdrum life and plain self indeed becomes Cinderella in reality. The conflict between Cross and Eya during the first three books were enough interest. The introduction of Yvette and Diandra at the last book was somewhat unnecessary although they did add more color to the already colorful story. Also, how Cross and Eya finally became an item was also somewhat forced. Their extended sort of courtship was in fact more exhilarating than them becoming an actual couple. Nonetheless, I enjoyed the story from start to finish and was excited to collect all four books. I also look forward to the movie adaptation of Viva Films soon. I am also looking forward for the movie version. Hoping it'll be good. Me too. Based on news or gossip articles about it though, it won't star popular love teams contrary to what most fans expect. Hi! First of all, thanks for replying. Teehee. On my opinion, I'd also for the non-popular casting/love teams 'cause if the Viva staff will pursue those in demand stars like Kathniel ( I don't even like Daniel Padilla), I feel like they won't give justice to the characters. I watched Denny's interview by Viva under the Viva youtube acct. She even said she'd like to have an audition for those probably not-so-noticed stars who would love to assume the roles. Makes sense. Happy New Year as well! I've seen this before somewhere that KathNiel would not be an option for the portrayers of Cross and Eya. As for James and Nadine, physically, they are suitable for the roles. Haven't seen them act ever...but let's hope they will do good. Kasi, I hate to admit, nawawalan na ako ng tiwala sa Pinoy movies. You know what I mean here, diba? Wag ka naman magtampo sa pinoy movies. Marami pa naman magandang movies na mapapanoood. :) Bakit hindi pwede ang KathNiel? Hindi naman sa nagtatampo ako, pero kasi iilan lang talaga yung Pinoy movies na de-kalidad for me. I've heard nga yung movie na 'My Little Bossings', halos puro endorsement nga raw ng products ni Kris Aquino eh. well, about the KathNiel thing, I don't remember the exact reason pero it's somewhere in the lines of hindi pumayag yung manager nila. Sorry, di ko tlg maalala. hihi. I have to agree with you about some films. Iilan lang talaga yung may kalidad, mostly indie films pa, not mainstream. Sayang nmn KathNiel, I love G2B soap nila. Hehe. Corny. The movie version will be summarized I'm sure 'cause the book is a bit long. That's so true. Sa Indie films mo pa mas madadama yung 'art' of making movies. Kasi yung mga mainstream (ang rude man pakinggan) pero basta for the sake na lang na kumita eh. Haha :)) hindi talaga ako fan ng KathNiel, pero I gotta admit Kathryn's pretty. Kay Daniel naman, nung una ko syang nakilala, gusto ko yung bad boy appeal nia, pero kasi...parang wlang energy masyado yung pag-acting niya. Nakukulangan ako. I dunno. Pinapanood ko din yung G2B pero not to the point na nakasubaybay ako. Na-cucurious lang ako pano babalik alaala ni Joaquin. lol. Maraming cute scenes nga. Tamang kilig lang. Wala masyadong uber. Funny how I still read books like these and watch G2B 'cause I'm already... :) Location? Up north. Haha! Parang Candy magazine kasi mostly ang Wattpad stories, mas patok sa mga Filipina teenagers and young at heart. OMG ang astiiiiiig talaga na kinuha ng Star Cinema ang TBYD <3 OMGOMG may chance na magka-intl screening sia. I'm living kasi in Canada. hihi. JOSEPH MARCO as TOP. <3 Tapos sabi nila si Jessy Mendiola daw as Sam. Pero ok din sa akin si Kim Chiu. Hehe. Corny ng full name ko. I've also heard about She's Dating the Gangster to be adapted in film. Nabasa ko yung published version pero ayoko ng ending. Sad. :( Kahit pa maging KathNiel yan. Yep. Ang sad ng ending so I made an alternate ending in my own imaginative mind. Hehe. My name? Thanks! The Fault in our Stars? Not yet. Oh girl, you are missing you gotta read it. like now na. hahaha :)) I'm sure naririnig mong in a few months ipapalabas na ung movie adaptation, kaso ang tagal pa sa Philippines. August pa sa inyo! Dito kasi June. Sige, I'll go search the book and see if I can start reading on mobile. :) Thanks! You've got more time pa to read. haha. :)) enjoy. kainis nga di ako naiyak. hnd siguro lang tlg ako that emotional. but I got so sad sa story,yet it's a wonderful read :D balak ko nga pag summer na dito, Imma buy other John Green books...like yung 'An Abundance of Katherines' and "Looking for Alaska"
Yup. I saw the movie poster (says it's based on a book) & it's currently showing. Comedy di ba? I haven't seen it though. Yup it's comedy. I asked someone who tweeted na he’s watched the movie, kasi nagkaroon siya ng screening sa UP campus. He said maganda daw and funny. I’ve read the book, too and by the looks of the trailer, close naman siya sa book. Although, yung sa special someone part, hindi naman kasi masyadong elaborated sa book yun, pero sa movie, I got a feeling na they expanded a bit. I dunno. Not sure. Yeah..you can say that. :)) Have you attended any of those Gold Rising events by the PSICOM authors? I'm not anywhere close to the event venues eh. Ohhh...I see. Hay eh pano pa ko, nasa abroad! Hay I'd love to go to their mall shows. You work abroad? Don't you ever go home sa Pinas? Nope, not working. Student pa ako ehehe. nag-migrate kami dito about almost 3 years ago with my family. Hehe. yeah.. :)) I'm still young. ^Ah ok. How are you adjusting to their culture and language? So you probably know how to speak their language by now? Ay oo nga pala Canada. Pero may mga French speaking places din dyan di ba? Ah ok. Would you ever want to learn French? OMG the official cast of DNP is out naaaa :) nagka-presscon na nga eh. James Reid was a PBB winner back at 2010. Nadine Lustre, on the other hand, is a TV5 talent (former GMA but I dunno kung andun pa rin siya). Actually, when I watched Vice Ganda's first movie Petrang Kabayo, Nadine was there..gumanap na secretary. Okay naman yung acting. Well, I just hope na magampanan nila maigi yung roles :D That's all that matters nman. Kasi ang physical looks, madali naman i-manipulate eh. Yep. Si Nadine Lustre, pwede naman gawing mukhang Eya. I don't have Instagram eh. The app isn't available for my phone's OS. Festival? That's the part where they got married sa booth & he kissed her on the tip of her nose di ba? Haha. Love that part. Yup. Yun magiging dahilan para finally maging open si Lory for the possibility of dating Chad na matagal ng may gusto sa kanya. Pareho lang from Wattpad to the book except of course mas shortened na yung book. Sure. I might even write about it here. I saw your post about 'The Bet', and I searched it in Wattpad..it had 27M reads there..so I'm guessing it's a good story huh, but u said may resemblance siya sa OBTCH. Yup. It's a good story. The publisher (Summit) translated the Wattpad version into English though. Yes, it's similar to OBTCH dahil dun sa idea ng bet to win someone's heart deceptively. Andami books lagi sa NBS and I feel like buying, reading, and writing a review about them kaso kinda busy lately. Baka di ko rin mabasa. ^That's what I thought too but when I looked it up on Wattpad (all Summit books I read and reviewed here), they were written in Tagalog so I figured that the publishing company translated them to make them viable for more readers worldwide apart from Filipinos. Yeah, I know that those pop fiction books are in Tagalog back at Wattpad, but kasi yung a author ng "The Bet", there were a few chaps posted pa rin sa Wattpad,...and it's still in English tho. Ah oo nga, English sya. Yung iba kasi Tagalog nung nahanap ko sa Wattpad like 3W8L. Nope. What is it? By the way, you can drop me a line on Facebook (medyo nagiging thread na kasi tong comment sa article na to, hehe) or the other social media sites (see icons on top right corner).